Right after Christmas I had a few days where I really began to feel challenged with how I wanted the rest of my life to look like. It might have had something to do with the fact that I had just turned 40 and every day I open up twitter or Facebook and read of this person dying at 38 or this person dying at 42 and I have begun staring my own mortality in the face. A lot of it was being closer to people who HAD deep losses and how eyes were being opened to the fact that this life is shorter than we think there is and yet this life is not ALL there is. I dropped by to see two girls who were eating dinner one night that week and meant to stay for 5 minutes and ended up staying a few hours. These two girls would have probably never crossed paths but both of their husbands died in the last year in completely surprising ways and they were left with 3 or 4 children each. 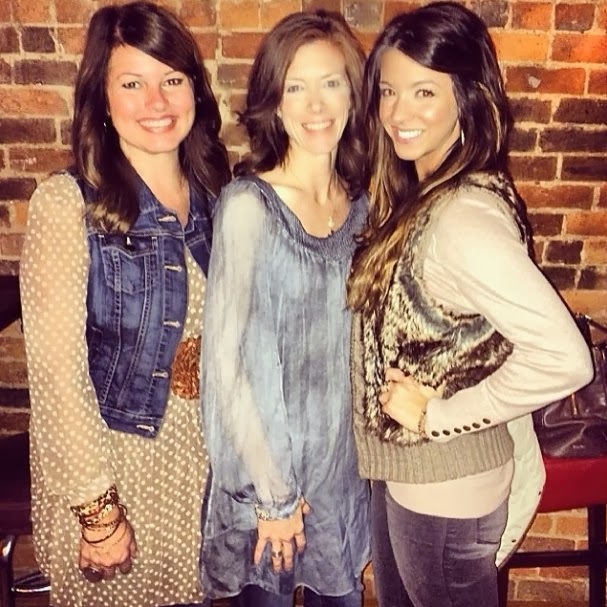 Sarah (in the middle)'s husband died in a routine, out patient knee surgery. Courtney (who lives in Atlanta)'s husband was killed riding his bike last November. He was from here. They connected after I shared Sarah's story and the day Courtney messaged Sarah to reach out to her - Sarah had just buried her husband and looked over and realized he was buried RIGHT NEXT to Courtney's husband. God moment. Unfortunately they have formed a little club no one would ever want to be in. They have several women all over the country who they talk to often who have lost their husbands. And where bitterness could lie, hope and faith are growing instead. Courtney shared of her hunger for God's word and her passion to share Him more than ever before. She felt a purpose in her pain and so does Sarah. And they are living it out. I don't know where that strength can come from but the Lord. I'm so in awe of both of these amazing women. And I share their desire to make Jesus known. And then two days later I went to a Celebration Service for my precious friend Janet who died at 51 of Ovarian cancer. She was one of the Godliest people I have EVER known. Her service was over two hours long. Janet planned every detail before she went to be with the Lord. We sang worship songs like "10,000 reasons" and her brother shared about her life. But the thing I will always remember is two weeks before Janet died, she filmed a video to be played at her funeral. In it, she told us not to be sad because she was finally with Jesus and she wouldn't want to come back. She shared Christ even after she was gone and people came to know Him at her funeral. (You can watch it on-line if you want to be inspired. Her video is around 52:50 in) Janet lived much too short a life but it was one that was full of intention. And over the last few weeks I just keep thinking that I'm grateful for my life. I'm grateful for our warm home and for Scott and my girls and our families. I'm grateful for friends. I love Sonic and college football and big bows ..........but let's be honest - what I know is that everything is meaningless without Christ. I want my life to count for something. I don't want to be a "big name". I don't want to be "famous". I just want to live a life that points to Him and that pleases God. And so I feel a restlessness to take this life by the horns and run passionately after Jesus. Do you ever feel restless that what you are doing is just not important? Don't get me wrong - I'm not saying being a mom isn't important. It's SUPER important. I'm shaping little hearts and I take it seriously. I just pray I'm having an impact on them. I pray that people around me can see past all my annoying personality traits and see Jesus somehow. I want to pursue God's will for my life. I may not even know what that is until after I'm in heaven but I think if I just keep staying in His word and praying and trying to know Him more each day, I will at least be closer to what He's leading me to. Jennie Allen has a new book that just released called "Restless". It's this very idea. 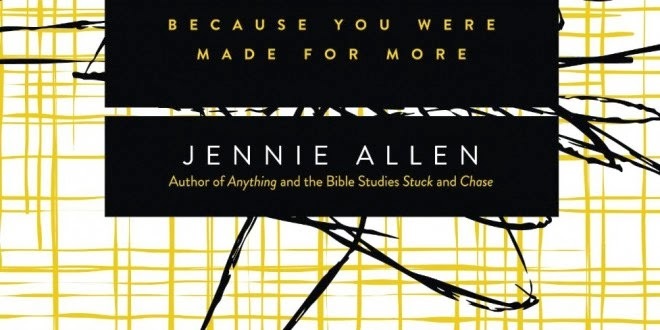 Jennie writes in Restless: Because You Were Made for More, “We are called to dream but we’re afraid to. But because we are called, when we don’t act on it we become restless—restless to find purpose, to make a difference in the world, to matter.” What if discovering God’s unique calling for your life is your greatest responsibility, second only to knowing and loving God? Your restlessness may very well be a divine invitation to purpose, calling and life. I have FIVE copies of Jennie's new book to give away today! I think you will be impacted so much by reading this. Leave me a comment and tell me what makes you feel restless or why you would like to read and I will draw five winners on Friday.